Deputy President William Ruto has brushed off claims of a possible fallout with his boss President Uhuru Kenyatta saying the Jubilee government is unshakable. Speaking during an inter-denominational prayer service at Sogoo High School grounds in Narok County, yesterday, Ruto said the narrative that the jubilee party is on the rocks is a creation of people intent on distracting the government’s development agenda. The Deputy President noted that he has never taken offence from any reference to him by the President. “I saw today they have filled newspapers with lies. I want to help them by asking them to believe in God and not in themselves. Eti wanasema sijui kutangatanga, mara Kijana (They are saying I’m loitering and referring to me as a young man). I personally have not complained, who are you to purport to complain on my behalf,” posed the DP. He said that his tour of the country was approved by the President and that his opponents were only spreading propaganda. Ruto added that Jubilee was not formed to win elections but to improve the lives of Kenyans. He added that his critics should stop wasting their time trying to create imaginary divisions between him and the President. “When we chose to dissolve URP and TNA, we did it deliberately to unite all Kenyan communities and to bring transformative development. Sisi hatujatupa network (We have not lost direction). We know where we are going,” the DP declared. 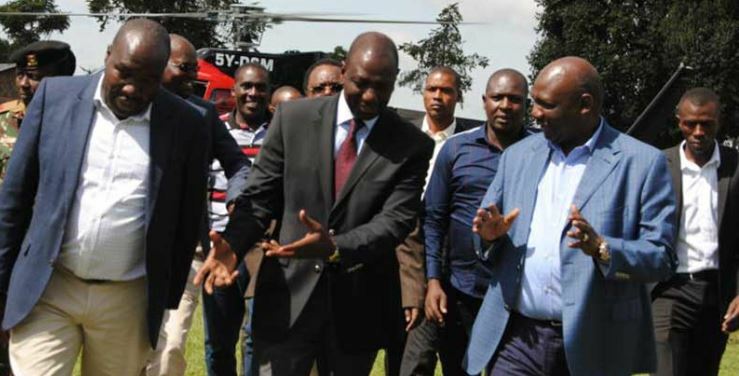 Leaders in attendance, among them Nairobi Senator Johnson Sakaja echoed Ruto’s sentiments saying the ‘marriage’, which was marked at Nakuru’s Afraha Stadium in 2013, was still intact. “I was a young man serving as TNA Chairman when the union between the two leaders was formed. My URP counterpart Francis ole Kaparo and I exchanged caps as a sign of unity. The sole objective of dissolving the two parties was to unite all Kenyans, and nothing has changed,” said Sakaja. Speaking separately, National Assembly Majority Leader Aden Duale also denied claims of bad blood within the Jubilee ranks. Speaking Sunday when he disbursed constituency bursaries at Garissa High School, Duale said the Jubilee Coalition remains united and focused on delivering its campaign pledges.